Do modern audiences care about Blade Runner 2049? Or do millennials, who make up a majority of the box office, consider it a boring relic from a bygone era? That's tough to discern in today's constantly changing market place. With pop culture shifting faster than it ever has before, it's hard to discern where the movie will eventually land with audiences. Right now, it's targeting a $40 million opening weekend. Some are calling that strong, but it's not much more than Alien: Covenant made on its dismal opening weekend, pulling in $36 million. It may be hard to remember now, but before Alien: Covenant opened, there was a real excitement for the movie. Fans and critics alike wanted to see what Ridley Scott would do when he REALLY returned to the world of Alien after the somewhat disappointing Prometheus. It was supposed to be the true Alien prequel. Then the first critics saw it, and things went down hill quickly. The movie took in $36.1 million on its opening weekend, which came as a disappointment to the studio. The sequel prequel hybrid didn't stay in theaters long, and it only grossed $74.2 million domestically, not enough to cover its $97 million budget. The film pulled in $158.8 million in foreign markets, with the worldwide total resting at $233 million. Not enough to cover the expenses after marketing and everything else is factored in. And Alien: Covenant is not considered just one of the biggest and most disappointing bombs of the summer, but of 2017 as a whole. And it has been partially blamed for such a dismal year at the box office. The movie tanked so hard, Ridley Scott was raring to go on two more Covenant sequels, but the studio put them on indefinite hold, and the franchise now sits in limbo. The good news in this scenario is that Ridley Scott stepped down from making Blade Runner 2 so that he could focus on his Alien universe instead. Director Denis Villeneuve, who simultaneously wowed and bored with his sci-fi drama Arrival, took over instead. But there is no mistake. Ridley Scott's finger prints are all over this new tale of Replicants, coming up with the story and producing the movie. And it's hard to imagine that the two hour and forty minute movie won't bore just a little bit. A first clip was released, and some have criticized the overacting by Walking Dead star Lennie James, who runs a sweat shop full of kids. It's the first crack in this surface. Though, some who have waited forever for this sequel are holding out hope. It's been more than 35 years since Blade Runner hit theater screens in 1982. A lot has changed since that time. The original movie was a box office bomb. In the years since it has become revered as a masterpiece. The gap between sequels is certainly a risky one. And it hasn't fared well for other sequels that have tried to make such a jump. According to The Hollywood Reporter, Blade Runner 2049 will probably pull in $40 million during its first weekend. Consider that IT, which cost a lot less to make, earned over $100 million on its opening weekend. So can we really call $40 million making it big in Hollywood nowadays. Headlines suggest this is strong, and maybe it is for a franchise that only has one other movie to its name and has rested dormant through multipole generations of ever evolving taste. Some are making the claim that Blade Runner only made $32 million in total during its run at the box office back in 1982. Blade Runner 2049 will have already outgrossed its predecessor within its first weekend, if it makes $40 million. That's possibly the dumbest argument going. Blade Runner 2049 is set 30 years after the original movie. We get a new blade runner named Officer K, played by Ryan Gosling. He unearths a long-buried secret that could drag what's left of society into utter chaos. He sets out to find Rick Deckard, a former blade runner who has been missing for 30 years, and may or may not be a replicant himself. Harrison Ford returns to reprise his role, and we've barley seen him muster up the excitement to sell that hope. This isn't all smiles like it was when The Force Awakens came out. Method actor Jared Leto plays the villain Niander Wallace, who appears to be behind a vast Replicant conspiracy. Director Denis Villeneuve is known for his movies Prisoners, Sicario and Arrival, which have all garnered much praise, but are not necessarily on the tip of pop culture's cult tongue. He doesn't have a genre movie under his belt that is worshiped by the kind of nerds that will gravitate towards a Blade Runner sequel. That said, most believe $40 million is a solid opening weekend for an R-rated thriller. Until you realize that both IT, Logan and Deadpool, all R-rated movies with name recognition titles, went well beyond $40 million in their opening weekend. Blade Runner 2049 has a reported production budget of at least $100 million, which is a bit more than Alien: Covenant. If the movie is good, it should be buoyed by strong second weekend box office sales. But if it's a boring slog, it will disappear quite quickly, and could be another disaster for Ridley Scott, who also has All the Money in the World hitting theaters before year's end. The movie should fare well overseas. And could become a substantial hit in China, which may save its fate. 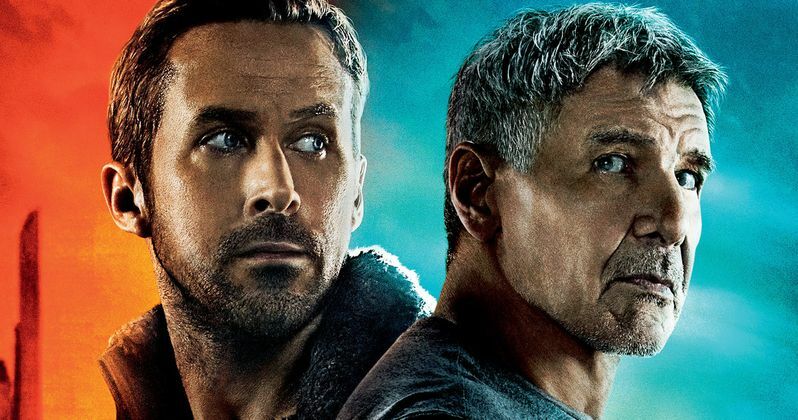 Blade Runner 2049 can thank its lucky stars that it doesn't have much competition during its opening weekend. My Little Pony: The Movie is coming that same frame, along with the thriller The Mountain Between Us. Everyone in this game is gunning for a very different audience. But never underestimate the communal power of the Brony! Which is vastly superior to what ever Blade Runner fans call themselves. In recent box office memory, long-delayed sequels have had a very rough time making their money back at the box office. Zoolander 2, Anchorman 2, Dumb and Dumber 2 and Trainspotting 2 barely registered with today's audiences. Blade Runner 2049 may wind up being the exception. But we doubt it.